Delight your recipient with this wonderful combination of flowers that is full of the freshness and happiness of spring. The bouquet is composed of pink lilies and roses and is ideal for transmitting your feelings of admiration towards a loved one or to show your gratitude for everything they do for you with the help of its vivid colours, which provide a calming sense of peace and tranquility. Send it as a birthday present, to celebrate an important milestone or simply to make any day marvellous. 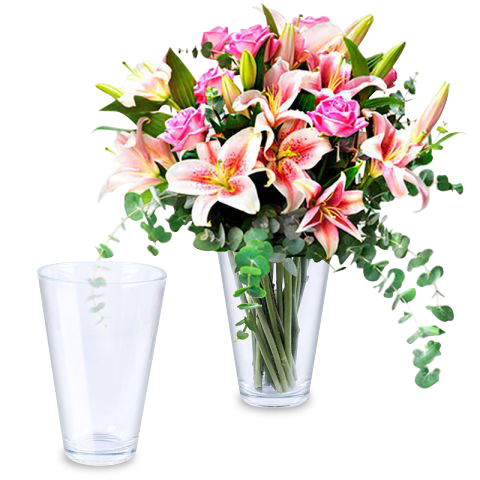 This bouquet can be enjoyed and put in a special place in their home as soon as it arrives as it is accompanied by a transparent vase. Who are you going to surprise? Great service shipping flowers internationally!